Roster is a powerful module within our charity management software suite. This rostering tool improves service delivery to clients by ensuring that users roster the right person, for the right job, at the right time. The charity system also saves organisations time and money by simplifying and automating the community support worker scheduling process. This enables valuable staff resources to be freed up and switched from back office processing to more productive areas. 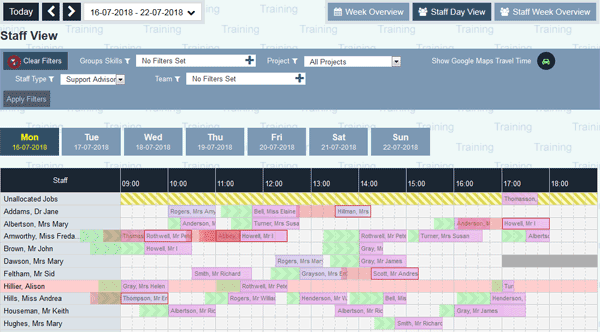 Aided by Roster, you can create visit schedules, assign support visits, and then automatically create calendar-based work schedules for each community worker within their team. The powerful search and match facility enables selection of the best support worker for each client. Daily, weekly, and monthly values can be applied to schedules as required and calendars with drag and drop allow visits to be easily re-scheduled. Our cloud-based rostering tool also offers visibility of the nearest-matching workers (via Google Maps) and automated mileage/travel time calculation. Similarly, when using the Google mapping add-on, you can see travel time between jobs displayed on the calendar view of the day's work, giving a clear indication of where issues might arise with travel time between jobs. The service integrates seamlessly with our charity CRM, enabling all the usual contact recording and outcomes provided by Charitylog to be merged with client care plans, the assignment of visits and the production of rosters for individual support workers. Roster also integrates seamlessly with the Charitylog Call-round mobile app, allowing support workers to view, update, and confirm schedules on their mobile whilst at home or out and about. When used our charity mobile app, there is also a live update of the calendar and other job information such as client expenses and notes. Discover how our cloud roster and many other charity systems can help your organisation. Request your free demo today. Assign support visits and then automatically create calendar-based work schedules for each support worker within your team. After required parameters have been selected, the location of the nearest matching workers can be displayed via Google maps. Uses Google maps to calculate the time and distance between scheduled visits so that mileage doesn't have to be entered or checked. Also checks for adequate travelling time between visits. Flexible charging system for creation of accurate invoices based on attended hours. Also creates payment file for export to payroll. Data from care plans and work schedules can be accessed by the Charitylog reports feature and used to generate vital metrics.